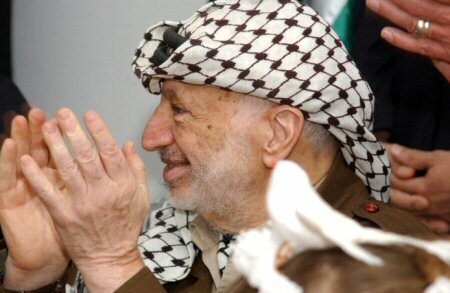 The 14th anniversary for the passing of President Yasser Arafat (Abu Ammar) coincides on Sunday, WAFA reports. On November 11, 2004, Arafat died at a French hospital where he was flown to after suffering from a sudden illness, following a tight and inhuman Israeli military siege of the presidential headquarters in Ramallah. The late president was born in Jerusalem on August 4, 1929, as “Muhammad Yasser” Abdul Ra’ouf Daoud Suleiman Arafat al-Kidwa al-Husseini. He was educated in Cairo and participated as a reservist officer in the Egyptian army, in fighting the tripartite aggression against Egypt, in 1956. He studied at the Faculty of Engineering at Fouad I University in Cairo, and was an active member, at a young age, in the Palestinian national movement, through his activities in the Palestine Student Union, of which he later became its president. He also joined a group of Palestinian nationalists in the founding of the Palestinian National Liberation Movement (Fateh) in the 1950s. He was elected chairman of the Executive Committee of the Palestine Liberation Organization (PLO) in February, 1969, after Ahmad Shuqeiri and Yehya Hammoudeh. Yasser Arafat and the leadership of the PLO became guests in Tunisia, and, from there, he began to work on going to Palestine. On October 1, 1985, Yasser Arafat miraculously escaped an Israeli raid on the Hammam al-Shat suburb of Tunis, which led to the death and wounding of dozens of Palestinians and Tunisians. In 1987, Arafat directed the first uprising, the Stone Intifada, which broke out in Palestine, against the Israeli occupiers, in December of that year. At the same time, he fought political battles at the international level for the recognition of the Palestinian people, and of their just cause and aspirations. Following the Declaration of Independence in Algiers, on 15 November, 1988, the late leader presented, at the United Nations General Assembly, on 13 and 14 December of the same year, a Palestinian initiative for a just peace in the Middle East. The General Assembly was moved, at that time, to Geneva, after the United States had refused to grant Arafat a visa to reach New York. The initiative set the foundation for US President Ronald Reagan to initiate, on 16 September, a dialogue with the PLO, that started on 30 March 1989, in Tunis. Yasser Arafat and former Israeli Prime Minister Yitzhak Rabin signed, on September 13, 1993, in the White House, the Oslo Declaration of Principles between the PLO and the Israeli government, which allowed Yasser Arafat, the PLO leadership and resistance fighters to return to Palestine after living in exile since 1948. On January 20, 1996, Yasser Arafat was elected president of the Palestinian National Authority (PNA), in general elections, and, from then, began the process of building the foundations of a Palestinian state. However, after the failure of the Camp David negotiations, in 2000, as a result of Israeli intransigence and Yasser Arafat’s insistence to not negate Palestinian rights and constants, the second uprising, the A-Aqsa Intifada, broke out on September 28, 2000. Israeli forces and tanks besieged Arafat at his Ramallah headquarters, after accusing him of leading the Intifada. The Israeli army also invaded Palestinian cities, in an operation dubbed “Protective Shield”, and kept him under siege, in a tight space that lacked the minimum conditions for a human living, until his death on November 11, 2004. Yasser Arafat has gone 14 years ago in body, but he left behind a legacy of struggle and a national strategy that had established for an approach followed by the founding leaders, headed by PA President Mahmoud Abbas.